Pekkala: He was the Romanovs’ most trusted investigator. Now he’s Stalin’s greatest fear. He operates in the shadows of one of history’s most notorious regimes. He seeks the truth in a nation where finding it can mean death—or worse. His name his Inspector Pekkala, and this time he’s taking on a case with implications far deadlier than anything he can imagine: a shattering revelation that was never meant to be unearthed. Its official name is T-34, and this massive and mysterious new weapon is being developed in total secrecy in the Russian countryside, a thirty-ton killing machine. Its inventor, Colonel Rolan Nagorski, is a rogue genius whose macabre death is considered an accident only by the innocent. And Josef Stalin is no innocent. Suspecting assassins everywhere, he brings in his best—if least obedient—detective to solve a murder that’s tantamount to treason. Answerable to no one, Pekkala has the dictator’s permission to go anywhere and interrogate anyone. But in Soviet Russia that’s easily a death sentence. The closer Pekkala gets to the answers, the more questions he uncovers—first and foremost, why is the state’s most dreaded female operative, Commissar Major Lysenkova, investigating the case when she’s only assigned to internal affairs? Pekkala is on a collision course not only with the Soviet secret police but the USSR’s deepest military secrets. For what he is about to learn could put Stalin and his Communist state under for good—and bury Pekkala with them. 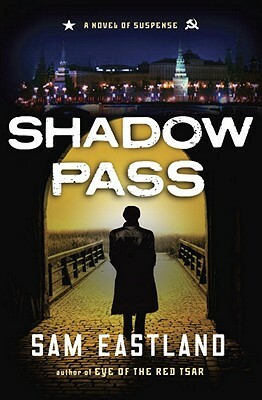 Brilliantly researched and rivetingly plotted, Shadow Pass is a superb story of suspense in a series growing only richer—and with a detective getting only better. Sam Eastland is the author of "Eye of the Red Tsar." He is the grandson of a London Police detective who served in Scotland Yard's famous "Ghost Squad" during the 1940s. He lives in the United States and Great Britain and is currently working on his next novel.